Having enough power to go around is important. Huawei had recently done a study that showed it's a big concern for a lot of users. Picking the right charger is important too... in our household, I have a work iPhone (lightning connector), a Pixel 3 XL (USB-C), my wife has a Moto Z (USB-C) and my son uses a ZTE Axon (microUSB). Then we have a couple of speakers and lights etc... that all charge via USB. Having not only charging, but cables is important. When I pack for a trip and I bring a charging bank I bring multiple cables. I used to love my old Moto and Tylt chargers that had the microUSB cable built in to charge. But I can't keep a USB adapter with me at all times. Enter the intelliARMOR Scout power bank. This is now up on indiegogo and is trying to raise funds to bring it to light, and it's the Swiss Army Knife of power banks. 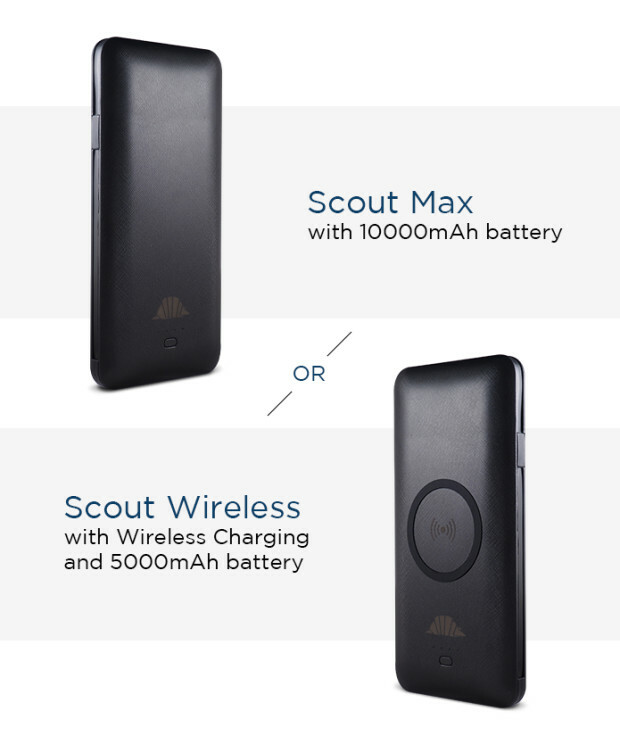 There's the Scout Max (10,000mAh battery) or the Scout Wireless (5,000mAh but has Qi). Either seems to be that they'll retail for $80USD. But, early backers can get in on it for just $20. It'll have the plug for the wall (no cord to worry about for it), it'll have attached cables for lightning, for microUSB and USB-C.
Each will be about 2.1A, so don't expect rapid charge (and forget trying to charge my Pixelbook or Slate). Would be nice to have everything all in one. I wish there was a Qi version with more juice tho'... but being able to just plug it into the wall is a handy trick. (Irvine, CA) – December 5, 2018 – intelliArmor, a lifestyle technology company, making well-designed, intelligent solutions for mobile gear and protection, today announced Scout Wireless and Scout Max. These fully loaded portable power banks feature built-in wall chargers and cables, quick-charging USB ports, proprietary intelligent charging technology, all in a slim design weighing less than three ounces. Scout is compatible with all mobile devices, allowing users to be stress-free about losing power whether at home, traveling or off the grid. An Indiegogo campaign (https://igg.me/at/myscout), has a funding goal of $10,000 USD, features limited Super Early Bird specials of $19.99 USD (75% off retail) and several other rewards for early backers. With Scout, carrying around tangled cables and multiple chargers are a thing of the past. This unique power solution comes in two different models, Scout Max (10000 mAh) and Scout Wireless (5000 mAh), each has a micro USB cable, USB-A port, Lighting Cable, Type C cable and for charging a Micro USB Port and the game-changing AC wall plug. Given all this versatility, the user can simultaneously charge any of their devices, from phones, tablets to gaming devices with the Scout. Scout has built-in proprietary intelligent charging technology that auto-detects new connections and automatically adjusts to the current specific needs of the user’s device, while also keeping the user safe with its internal circuitry that protects from over-charging and short circuits. Users can get two to three recharges of their smartphone with Scout, and with it’s ultra-slim, lightweight design, it easily fits in a pocket or a bag, making it easy to power-up when needed.